A poor man’s cruise missile: silent, low-flying, low-signature “suicide” drones could soon see combat. Several few weeks ago The Diplomat reported that the U.S. military was developing unmanned aerial vehicles that are capable of making life-and-death “decisions” on their own, without the need for human input. This scenario, which immediately drew comparisons to at least one famous apocalyptic science-fiction movie, is worrying enough, raising fears of hordes of “sentient” drones turning on their former masters. Now there’s something else out there to worry about, and this one is much closer to seeing action in warzones — the “kamikaze” drone. About a year ago, reports emerged that the U.S. Army had placed its first order for “Switchblade” drones, small explosive-laden unmanned aerial devices that are launched from a tube and capable of loitering over an area until the order is given to dive at a target and detonate its charge. About the size of a backpack, the “Switchblade,” acquired as part of the Army’s Close Combat Weapons Systems project, acts as what is known as a standoff agile munition, with the soldier using video feed or GPS to identify targets and call in a “suicide” attack. The 2.5 kg Switchblade has an operational radius of 10 km, with an endurance of 10 minutes and an operational altitude below 500 feet (though it can reach 15,000 feet). 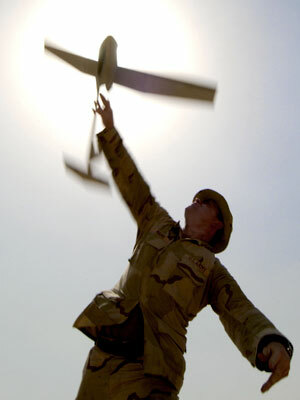 Unlike cruise or ballistic missiles, “suicide” drones make it possible for the controller to call off an attack even after the device has been “armed,” when, for example, a target has moved to a new position, or if the risks of collateral are deemed too high due to changes on the ground. The applications for dense combat environments, and perhaps even urban theaters of operations involving beyond-line-of-sight targets, are evident. The drones could furthermore provide yet another tool for targeted killings of high-profile (and oftentimes mobile) targets. According to more recent reports, the U.S. is not alone in developing that type of technology. The South Korean military is developing its own “kamikaze drone” — known as the “Devil Killer” — which can crash into targets in North Korea at speeds reaching 250 mph. Korea Aerospace Industries (KAI), working in cooperation with Hanyang University and Konkuk University, is developing the 25kg drone, which has a wing span of 1.3m (foldable) and a fuselage of 1.5m. According to South Korean media, the drone can fly at a maximum speed of 350-400 km/h and strike targets within a 40km radius within 10 minutes. The Devil Killer, which a spokesperson for KAI said can carry a payload of 3kg of explosives, or the equivalent of 10 hand grenades, is expected to be delivered to the South Korean military by 2016 at the latest. As with the Switchblade, the South Korean version can be controlled by video link or GPS, and can automatically hone in on a target according to pre-set orders, or be controlled manually if it cannot reach its primary target. Not to be outgunned, Pyongyang is reportedly working on its own “suicide” drone based on the jet-powered MQM-107D Streaker, a target drone developed by the U.S. Army in the 1970s. According to reports in South Korean media outlets, the North purchased MQM-107D models from an unspecified Middle Eastern country (presumably Syria) and mounted them with high explosives, though South Korean intelligence say Pyongyang continues to struggle with the technology. It is likely only a matter of time before similar technology falls into the hands of non-state actors, if they haven’t already. Groups like Hezbollah in Lebanon, which earlier this month successfully launched an unmanned aerial vehicle over “sensitive sites” in Israel before being shot down by an Israeli F-16, could seek to obtain or develop their own crude versions of “suicide” drones with assistance from state sponsors like Iran, Syria or China, among others. Their low cost — we’re not talking about the US$4 million-per-unit MQ-1 Predator here — and relatively simple technology means they will not be beyond the reach of poor states, sub-state actors and terrorist organizations. As a poor man’s cruise missile, silent, low-flying, low-signature “suicide” drones will be difficult to detect and intercept using air defense systems such as the U.S.-made Patriot that is used by countries worldwide. There’s nothing overly high-tech or even strikingly innovative about this new development, as North Korea’s alleged tinkering with the Streaker makes it clear. And that’s ultimately what is most worrying about kamikaze drones: Their low cost, low-tech requirements, and “permissibility” following their adoption by global military forces, risks inviting their widespread use. The country may need to look beyond a conventional defense, to deterrence by punishment.